In partnership with The Muslim Council of Britain and SOAS, the Centre for Islamic Middle Eastern Law we have organised a symposium to discuss important issues around the way Black Muslims are perceived and treated both within the Muslim Community itself as well as the general society through an exploration of issues around the history, culture and heritage of Black Muslims in the UK and Beyond. The event which will be in 2 parts will see both academic and religious leaders/scholars come together in a symposium to discuss important topics around the theme of the event in the first part, while the second part will showcase the rich heritage and culture of the Black Muslims, highlighting the important contributions of this segment of our community as well as promote mutual understanding and respect for one another especially in this very difficult period of Brexit. 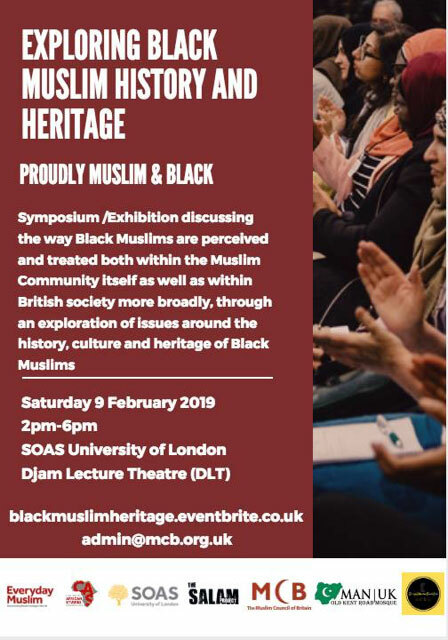 Inspirational talks by notable speakers, Q&A Session, Creative Performances such as Spoken Word, Poetry, Storytelling, Exhibition of years of documentation and archives by Everyday Muslim and a special African and Afro-Caribbean food exhibition will be provided to guests.